The AJC Peachtree Road Race, the largest 10K running event in the world with 60,000 participants, takes place every Fourth of July in Atlanta. Have questions about the process? The Atlanta Track Club is here to answer every Thursday from 11:30 a.m. to 12:30 p.m. until this year's run. Question: I can't remember if I requested by bib number for mail or pickup, how can I check? Answer: This is something that we can verify for you. Please email peachtree@atlantatrackclub.org to verify. Question: Is there anyway to still try and get in to register? Answer: Several sponsors of the AJC Peachtree Road Race will be holding contests and number giveaways at the Peachtree Health & Fitness Expo on July 2 & 3 at the Georgia World Congress Center. I can't remember if I requested by bib number for mail or pickup, how can I check? Question: I submitted a time that placed me in corral E however, I received a bib with corral G. This doesn't appear to be an isolated incident. Anyway to get this corrected? Answer: Start wave standards are determined based off the range of qualifying times that were submitted during registration. During the verification and assignment process, it may be necessary to adjust the standards from the previous year in order to accommodate the volume of runners and physical space allotted in each start wave. I submitted a time that placed me in corral E however, I received a bib with corral G. This doesn't appear to be an isolated incident. Anyway to get this corrected? FROM JILL VIA FACEBOOK: Is there anyway to still try and get in to register? Question: I received my race packet with race bib and flyers. Anything else I will need before race? Also, I paid extra for this year's commemorative medal. When/where do I claim it? Answer: Be sure to check out the participant instructions here- www.peachtreeroadrace.org (this link will take you directly to instructions download)If you selected to have your medal mailed, they were mailed separately from race packets and you should receive it soon. FROM MICHAEL VIA FACEBOOK: I received my race packet with race bib and flyers. Anything else I will need before race? Also, I paid extra for this year's commemorative medal. When/where do I claim it? 60,000 people will run the AJC Peachtree Road Race on July 4th. Will you be among them? 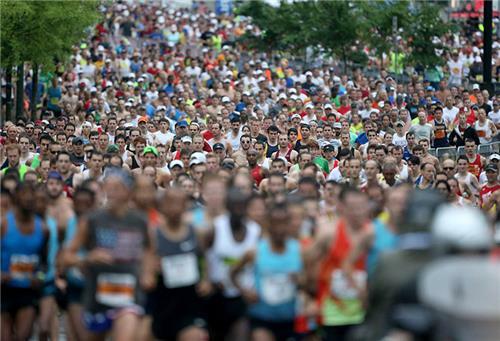 60,000 people will take part in the 2014 AJC Peachtree Road Race on July 4th. April: I submitted similar times two years in a row, but ended up in K one year and P the next. How are wave times determined? Answer: The start wave time standards provided are guidelines and each year placement depends on the number of participants in each wave which can cause some variance in placement over the years. I submitted similar times two years in a row, but ended up in K one year and P the next. How are wave times determined? Dennis: How soon after registering for the lottery will we know if we're in? Answer: All registrants will be notified by Tuesday March 25. How soon after registering for the lottery will we know if we're in? Start of the AJC Peachtree Road Race last year. Answer: Great idea! We'll look into it! 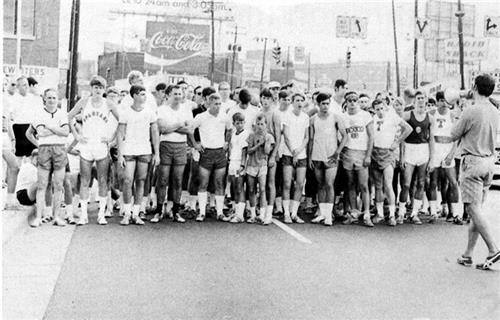 The start of the first Peachtree Road Race in 1970. Brittany: If I become a member of the track club today. Will it Allow me to get a advanced spot or will I have to wait until general registration opens? Answer: You must become an Atlanta Track Club member by February 1, 2014 to receive guaranteed entry in to this year's event. Therefore, if you are not a current member, you will need to enter the public lottery beginning this Saturday, March 15. Sam: I registered for the Peachtree Road Race in 2013, however, I couldn't run. Is there anyway to submit my unused bib for this year's run. If I become a member of the track club today. Will it Allow me to get a advanced spot or will I have to wait until general registration opens? I registered for the Peachtree Road Race in 2013, however, I couldn't run. Is there anyway to submit my unused bib for this year's run. Question: How do I register for the AJC Peachtree Road Race? Andy: Where do you get the design for the volunteer tshirts? I've noticed they are different from the finishers shirts. Hugh: We participated in an event that the organizers did not time, we timed it ourselves, can we use this time? Answer: A qualifying time for the AJC Peachtree Road Race is a time from any USATF certified course or Atlanta Track Club event. A qualifying time is not required, but entering a qualifying time determines your start wave placement. If you do not submit one, you will be randomly placed in one of the later start waves. Where do you get the design for the volunteer tshirts? I've noticed they are different from the finishers shirts. Paul: Are we able to pick up registered family members race numbers for them at the expo? - Copy of your ID (see above for acceptable forms of ID). - Copy of your race number confirmation. Amie: Do you have to be in races before registration to get a spot? Because I haven't did a race within GA and I'm not apart of the track club. Answer: No, it is not necessary to run a qualifying race before entering the public lottery. Anyone is welcome to enter regardless of your race experience. We're happy to be someone's first event! If you have run other races, if it was USATF certified, you can use your time as a qualifier regardless of it's location. You also do not have to be an Atlanta Track Club member to enter the public lottery. Members simply receive automatic entry into the event and can bypass the lottery. 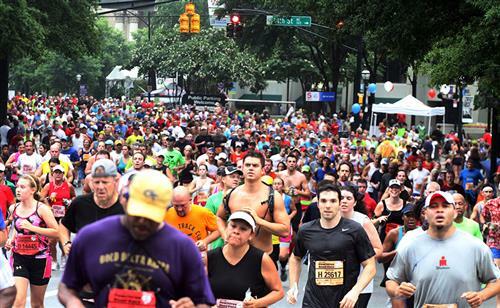 Mardi: When does registration for the 2014 AJC Peachtree Road Race open? Where do I find the link? Jim: What is the total elevation change of the course? The AJC Peachtree Road Race is an Atlanta institution. The event, which attracts runners and walkers from all over the US, is a great way to celebrate the Fourth of July. Do you have to be in races before registration to get a spot? Because I haven't did a race within GA and I'm not apart of the track club. If you have participated in the event for the last 17 years, it is still required that you enter the public lottery at ajc,com/peachtree. If you are not selected in the lottery, please email streakers@atlantatrackclub.org for special consideration. Thomas: Is the $150 "special entry" tax deductible? Answer: Yes - $115 of the charity numbers benefiting Kilometer Kids is tax deductible. Is the $150 "special entry" tax deductible? If you have ran the race for the last 17 years, do you get any preference over others? The last qualifying race for the AJC Peachtree Road Race is any USATF certified held before March 22, 2014 when the lottery closes. Races times are valid for two years. Question: How can I get a guaranteed entry into the AJC Peachtree Road Race? Answer: There are two ways to receive guaranteed entry into the event. 1. Atlanta Track Club Membership- A benefit of Atlanta Track Club membership is guaranteed early entry into the event. Memberships must be active as of February 1 of the current year to be eligible for that year's AJC Peachtree Road Race. when is the last qualifying race for the peachtree? Hi Kelly- If you are referring to new Atlanta Track Club member shirts, we're still in the process of packaging and mailing shirts out in waves. Your shirt should arrive soon. Thanks for your patience! Have all of the T-shirts been delivered (from the renewal)? Question: Do you have to run a qualifier to be in? Question: When will emails confirming registration go out? Shannon: Email membership@atlantatrackclub.org and we will be happy to assist you! My son and I registered as a family membership but when I went to register him for Peachtree it said he was not found. How do I make sure he is?